A dehumidifier is a phenomenal solution to discard excess moisture in your home or domestic environment. This helps in protecting your space from getting damaged. From the health point of view, there are many allergies which can be avoided with the help of dehumidifiers such as dust mites, mold, mildew, etc. Such allergies are more common in a humid atmosphere. Therefore a dehumidifier would be the best solution to keep yourself away from suffering from such allergies. Dehumidification is simpler and easier for smaller rooms as the capacity of humidity removal is not very high. A very uncommon situation would be to dehumidify the air in a room of approximately 400m³. This is a pretty large size to dehumidify. Most of us would not prefer to have 2 to 3 dehumidifier devices kept in a single room, this might look quiet crowded. As a solution to this, we have come up with a new model which would serve the purpose by just installing one single device in a large room. 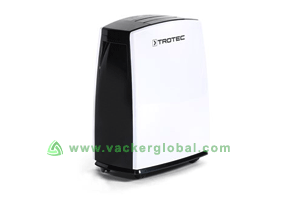 Vacker Global would like to introduce the newly launched TTK 128 E dehumidifier model. This unit is one of a kind which has a huge capacity of humidity removal. This unit is designed for larger rooms with a moisture removal capacity of up to 55 liters per day. 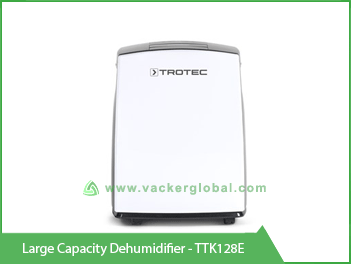 TTK 128 E being a large capacity based domestic dehumidifier model has an advantage of the hygrostat controlled system. This allows you to adjust the humidity level and once the same is attained, the compressor switches the unit off and ultimately saves energy. Dehumidification is a concern in the Middle East region as the weather is mostly humid throughout the year. 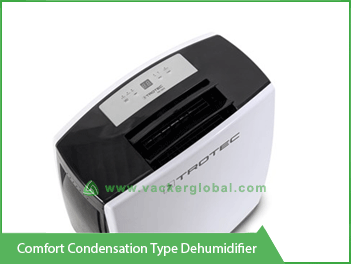 To be more precise, dehumidification is a concern for larger areas in the domestic sector like huge villas, museums, office space, etc. These locations would require high humidity removal capacity due to which we have come up with the TTK 128 E which can dehumidify an area of up to 160 meter square. This domestic dehumidifier has a two stage blower and has an easy methodology in handling the unit which provides a timer through which the operating time can be controlled. Normally the manual draining of the water tank in such units would be difficult on a periodic basis. As a solution to this problem the TTK 128 E comes with a separate hose which can drain out the condensed water automatically. Also to add on another feature of the unit, the TTK 128 E has a warning light which is lit whenever the tank is full. This helps indicate that the water needs to be discarded. At such times, the unit would be in the sleep mode until the tank is not empty. 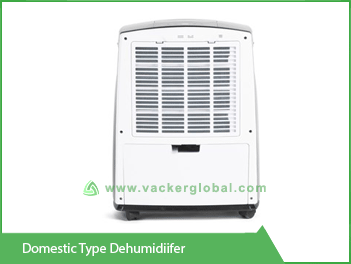 With regards to the applications for dehumidifiers for large areas, it is better to have a single unit of high capacity like the TTK 128 E. Many a times there are rooms interconnected within a house which are open to each other. In such cases a high capacity based unit would suffice the problem. To conclude with, the TTK 128 E has an operating range for temperature between 5 to 32°C and an operating range for humidity between 30 to 90%. This range would cover most of the natural routine scenarios. Also the sound level of the machine is approximately around 56 dB. Note: For your understanding, a table fan would produce a sound level of 45 dB.